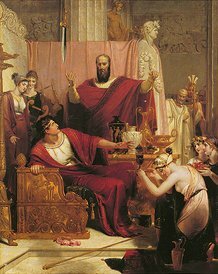 The picture shows a sword dangling above young Damocles by a slender thread. When I was a boy, my father told me about meeting some Christians who had a belief that everything that happened was God’s will. Even if they cut their fingers on a knife, it was God’s will. It must then have some holy purpose. Why would they resist it? My Dad said these people were very happy. He envied them their simple minded faith, but said there was no way an atheist such as himself could ever persuade himself of such a fiction. 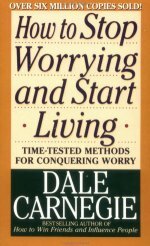 I read Dale Carnegie’s How to Stop Worrying And Start Living . It contained many tales of people who suddenly broke a lifetime habit of worrying themselves sick by turning the problem over to God. This gave them a great burst of energy then they used to tackle life’s problems. As far as I could see, God never actually did anything to help anyone out. It was simply the blind faith that nothing terrible would happen that saved the day. Written in 1944 in a Horatio Alger style. I began to wonder if there was a non-Christian equivalent for people who could not possibly swallow the Christian beliefs. At a suggestion from T. E. Lawrence, (Lawrence of Arabia) R.V.C. Bodely decided to live among the Bedouins of North Africa. Despite the harsh conditions, he found it the most peaceful time of his life. His Islamic hosts never let anything distress them. Whatever happened, it was Mektoub (written, Allah’s will). Allah knows what He is doing, so you just adjust to it, whatever it is. I gather he picked up this fatalistic philosophy by osmosis. Even when doing something as simple as making an appointment for coffee, Muslims will say inshallah (God willing), implying a happy acceptance of God stirring things up to make the appointment impossible. When things go wrong, God wanted it that way. Who are you to argue with God? Newton imagined the universe was like giant clock that God wound up and set ticking. If you knew the position of all the particles, you could in principle calculate where they would be at any point in future to an arbitrary degree of accuracy. This clockwork universe had a fixed plan created by God, that unrolled like a player piano roll or a movie script, in only one possible way. Free will was thus an illusion, just as the characters in a movie have only the illusion of free will. Then in the early 1900s Heisenberg came along and discovered that the clockwork universe was only an approximate model of how the universe worked. It was impossible, even in principle, to fully know the initial conditions. Further, at the atomic level, much was completely random, totally unpredictable and totally uncontrollable. In other words, even in principle, you can’t predict what is going to happen precisely. Free will is still an illusion, but no one can know even principle what precisely is going to happen. Then chaos theorists discovered that the flapping of a butterfly’s wings in Brazil could affect the weather in Europe. Tiny random effects can create huge macroscopic effects. The world is much less predictable than we thought. Science has no theory which incorporates free will. Perhaps some day they will, but, for now, science treats it as an illusion or something too slippery to say anything definite about. Science seems to suggest that our own actions and thoughts naturally flow from previous actions and thoughts, much the way Buddha described 500 years before Christ. Quantum uncertainty and chaos theory also applies to us humans, so we cannot predict with much certainty just what we will do or what will happen to us. Human vanity makes us imagine our powers of prediction are much better than they really are. We then set about tormenting ourselves with worry over all the dreadful things we are absolutely certain will befall us. Life is like stepping into a boat which is about to sail out to sea and sink. A good supply of resignation is of the first importance in providing for the journey of life. The version above is a variant from the Alcoholics Anonymous formulation courage to change the things I can which suggests you should randomly fool with things that are not broken. God is not necessary to benefit from this insight. Just noticing that you are trying to change something that you cannot change, may help you stop wasting effort on it. Just noticing that you are procrastinating a change that has to be made may give you extra motivation to get on with it. The waves washed crabs up onto the beach where they perished in the hot sun. A black boy ran along the beach picking up the crabs, tossing them back into the water. A man said, "Why do you bother? There are millions of crabs. You can barely make a dint. The boy replied It matters to this crab!" as he tossed yet another. Part of creating a meaningful life is balancing the ideas it ultimately does not matter and it makes a difference. A million years from now it is unlikely any record of any of us will have survived, yet obviously it matters to us that our loved ones are happy today. For the most part we are caught in a maelstrom with only the feeblest powers to have any effect on the world in general. Only within the narrow sphere of our private lives do we have any illusion of control. The problem with fatalism is it encourages everyone to give up, even when a tiny effort from everyone could have beneficial effect, e.g. to bring about world peace, end world hunger, or preserve the environment. You have to be like Johnny Appleseed, promiscuously scattering seeds, but not worrying about which ones will sprout. The Hindus express the idea this way, that you should dedicate the karma (fruits of your actions) to God. You should not concern yourself with whether you were successful, only that you performed skillful action. Whether you are successful or not is God’s problem/responsibility. Some people carry fatalism to silly extremes. For example, they may tell themselves God has predecided the time of their death and so there is no need to take any safety precautions, e.g. buy air bags for their car or buckle up or to look after their health, or avoid skydiving while drunk. They believe God has predecided if they should be rich or poor, fat or thin so there is no point in trying. The succumb to apathy and carelessness. If you believe every shaving nick was God’s will, it is a bit megalomaniac to think God has nothing better to do than create tiny annoyances for you, as if you were worthy of all that divine time and attention. The good kind of fatalism is to say to yourself, "So that’s the situation. That’s what is. Now what? Where can I go from here? " The foolish reaction is waste energy convincing yourself the universe has no right to be in this unpleasant configuration. The foolish kind of fatalism says, "I am powerless to do anything about anything. I thus should not put in even a token effort." The catch 22 is, it seems as though you are probably predestined believe or disbelieve in free will and to choose a defeatist or an activist life philosophy. Part of your predestination was to read this essay and be gently prodded to the activist track.